A North Yorkshire market town has pledged its support to a national campaign to promote the “shop local” message. More than 40 Boroughbridge shops have decided to put their weight behind the Independent Retailer movement, which offers small high street businesses access to resources to help emphasise the vital role they all play in the community. Of every £1 spent in small independent shops, between 50p and 70p finds its way back into the local economy, helping to boost confidence and the potential for further economic growth. And, as more than 90 per cent of the shops based in Boroughbridge are small independents, campaign supporter Sian Foster of the town’s Ella Georgia fashion and jewellery boutique says the initiative has found a particular resonance in the town. The fact there are so many smaller independents has meant Boroughbridge has been insulated against the recent gloomy news about some of the bigger chains. However, we’re by no means complacent and realise, if the town is to continue to thrive, we need to demonstrate what we can offer and work hard to both promote and protect that positive shopping experience. As a result, shops supporting the Independent Retailer movement are participating in an innovative Easter egg hunt this week, encouraging customers to pick up a “treasure map” from participating stores and then collect 10 egg stickers from shops on the trail. Customers who successfully complete the hunt will win chocolate Easter eggs. The Easter Egg Hunt runs until April 14 so there’s plenty of time to give it a go. I’m delighted so many shops have agreed to support it and, of course, we’re all hoping it adds to the value customers get from a trip into town and helps them learn a little more about what local shops can offer. Meanwhile, the Easter weekend will also see the town host the Yore Vision Festival of Walks from Saturday (March 30) until Saturday, April 6. Leaders will take explorers on ten different circular, family-friendly walks around the Boroughbridge area, explaining a little about local history and wildlife en route, with participants awarded a badge on completion. The Ure Walks Through Time programme, to be launched by Mayor of Boroughbridge Coun Liz Vose, has been arranged to mark the town’s success in being recognised as a “Walkers Are Welcome” community. However, we’re hoping it will become an annual event. Some walks will include refreshments, specialist talks and even an optional visit to a Roman museum. The programme also includes a celebration of a new 17-mile circular route which takes walkers along the River Ure out as far as Aldwark and back – only possible thanks to the opening of a new right of way. 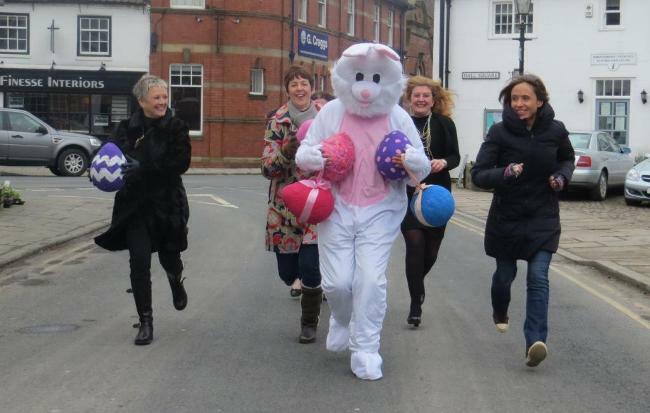 The Easter Bunny is pursued by (from left) president of Boroughbridge Chamber of Trade, Barbara Lambert-Hill, Julie Calvert of The Fruit Basket, Emma Lee of The Crown Hotel and Sian Foster from Ella Georgia – all keen to lay their hands on chocolate eggs for the town’s Easter competition.